After just two sessions, the students have already implemented new practices in the classroom, and they appreciate the benefits of training together. The childcare program at Eva's Village provides care for infants and toddlers throughout the day and after-school care for older children, allowing their mothers to focus on their own recovery. Ten of Eva’s childcare and education staff members are getting together for a new weekend ritual - early each Saturday morning, they attend classes together at Paterson’s Passaic County Community College (PCCC) campus. 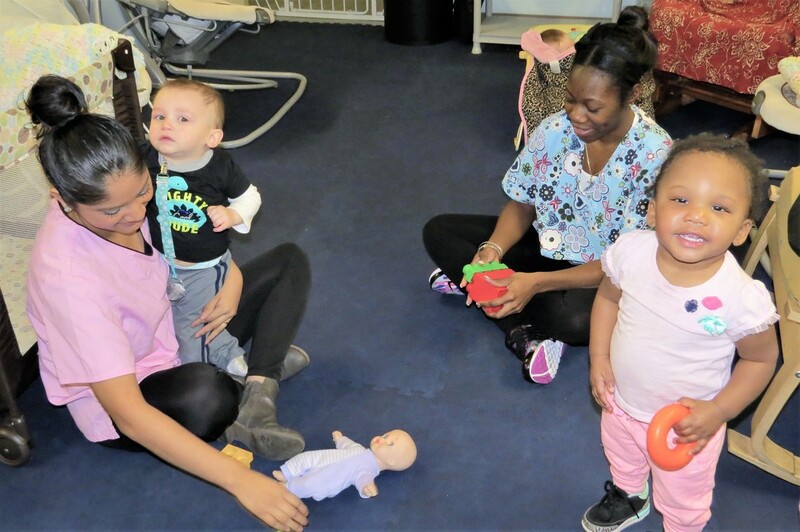 They are working towards their Child Development Associate (CDA) credential through a new, grant-funded partnership between Eva’s Village and PCCC. In addition to the nationally-recognized credential, they will earn 11 credits over two semesters, which can be applied to early education degree programs. The students are eager to learn new skills and to test new tools in the classroom, and they appreciate the opportunity for professional growth. PCCC ‘s Department of Early Childhood Education will teach them new lesson planning and curriculum development skills, safety and health awareness, social and emotional learning, and ways to strengthen family relationships. “I know this training will help me be a better servant to the children at Eva’s, as well as with my future endeavors as an art therapist,” said Clarisa Mercado, Assistant to the Program Coordinator of Eva’s Childcare and Education Department. Like several of the other students, she is already working towards a college degree. Fellow student, Shahida Aktar, a Childcare and Education Aide at Eva’s, has been interested in early childhood education since high school. She found in the CDA course “an opportunity I could not pass up,” to help her achieve her goal to become a family therapist or psychologist. After just two sessions, the students have already implemented new practices in the classroom, and they appreciate the benefits of training together. “I feel more connected to my co-workers than ever before as we strive towards this goal together,” observed Ms. Mercado. The partnership anticipates its positive impact will extend far beyond each student, not only to the children and families Eva’s serves, but to the wider community, as the training and support strengthens Eva’s Childcare and Education program. Eva’s Childcare and Education Department offers care for the children of mothers who come to Eva’s Village seeking services and support for homelessness and/or addiction. The program provides a community service for these children, who may spend from 6 months to two years at Eva’s. The partnership’s objective is to deliver increased training and support to staff who serve children in a non-school related program. The partnership's three goals are: to build staff capacity through CDA’s hands-on learning; to guide staff in family outreach activities that will foster home literacy learning; and to create an ongoing, supportive professional learning community to identify and support childcare and education needs at Eva’s. “We hope to use our partnership as a model to assist similar community-based agencies serving our community’s most vulnerable children,” explained Linda Carter, Assistant Professor and CDA Program Coordinator at PCCC’s Department of Early Childhood and Teacher Education.